Many thanks for corresponding with Minister Burton on our behalf. Whilst the letter provides factual information and some of it is drawn from the letter that will shortly go to parents in relation to the One-Parent Family Payment unfortunately it is still not clear what the Department’s strategy is in this area, what policy and research this was based on and how they will ameliorate the poor education levels of parents, the lack of employment and the absolute dearth of afterschool care. Regrettably it has become clear to me that these cuts were made without reference to policy or research but were simply a means of cutting the budget without touching the principal rates of social welfare payments. What is even more unfortunate is that so many of these cuts have fallen on the shoulders of the poorest families and children in Ireland. One Family and our members will continue to speak and advocate on these issues and we appreciate your assistance to date and we look forward to working with you in the future. 1 What will your party do in government to reduce the very high poverty rates experienced by one-parent families? 2 What are your views on the recent social welfare changes that require lone parents whose youngest child is over 14 to go on to Jobseekers Allowance rather than on the One-Parent Family Payment? 3 Do you believe that the definition of the family in the constitution should be changed? (Currently only the marital family is recognised in the Irish constitution). If not, why not? 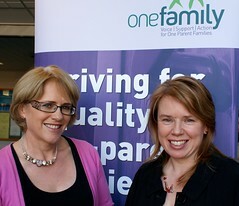 The seminar was held on Monday 18 January 2010 in DIT, Aungier Street, Dublin 2, chaired by RTE Drivetime’s Mary Wilson. family law solicitor Ciara Mathews of Gallagher Shatter and Candy Murphy, One Family Policy Manager.